Today I’m sharing an upper body strength training workout – perfect fro those trips to the gym when you’re not sure what to do or you’re feeling unmotivated. For each exercise you’ll perform 12 reps for 3 sets. 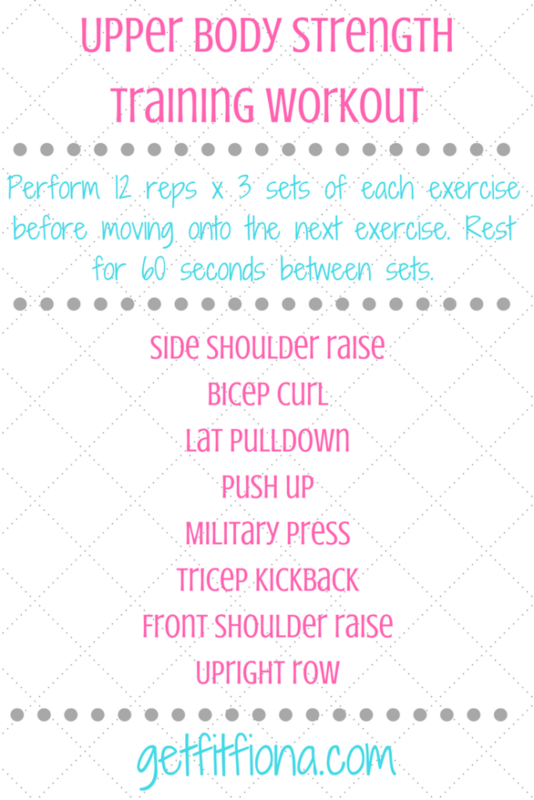 Do all three sets in a row before moving onto the next exercise. Rest for one full minute between sets – you need to give your muscles some time to recover between sets. All of the exercises below besides the push ups require dumbbells or weight on a cable machine. I get the “how much weight should I be lifting?” question a lot. Pick a weight that makes the last 2 or 3 reps hard to do, but you can still do with good form. This means that it might take all three sets to figure out the right weight. That’s perfectly okay! Just make sure that you’re keeping of each exercises weight/reps/sets, so you can use that information for future workouts and not have to keep guessing. Side shoulder raise // With your arms down at your sides with a dumbbell in each hand, slowly raise your hands away from your body to the side, keeping your arm straight at the elbow. Once your hands reach shoulder level, slowly lower them back down to your sides. Bicep curl // Start with the feet hip width apart, and back in a neutral position. With a dumbbell in each hand, keep your elbows in close to your side and raise the dumbbell upwards. Movement should be at the elbow, not the wrist. Lower the dumbbell with a controlled movement, not allowing gravity to take over. Push up // Starting on your toes and hands, make sure your body is a straight line from your heels to your knees, hips, shoulders, and neck. Your hands should be a bit wider than your shoulders. Slowly bend at the elbows, lowering yourself to the ground. Try to get at low as possible, and then push yourself back up, all the while maintaining that straight line. An easier modification is instead of being on your toes, lower to your knees. Military press // Stand with your feet hip width apart with a dumbbell in each hand. With your upper arms in a 90 degree angle to your torso and your hands directly above your elbows, lift your hands straight up so that your arms are straight above your head. Slowly lower your hands back down to the starting position. Tricep kickback // With a dumbbell in each hand, flex at the ankles, knees, and hips so that your torso is leaning forward slightly. Bring your arms close to your body with your elbows back slightly. Start with your forearm in a 90 degree angle to your upper arm and slowly extend your forearm until your entire arm is straight and your triceps muscles are contracted. Slowly reverse the movement so that your arm is once again at a 90 degree angle. Front shoulder raise // With a dumbbell in each hand, stand straight with your feet shoulder width apart. Slowly lift your hands in front of you so that they’re at shoulder height, with a micro bend in your elbows. Slowly lower your hands back to your sides. Upright row // Stand with your feet hip width apart, a dumbbell in each hand just in front of your thigh, palm facing your thigh. With a neutral spine slide your hands up your body until your hands are almost at your armpit. Slowly lower your hands back down to the starting position. Looking for more workouts? Check out my workouts page for lots more to try. As always, be sure to check with your doctor before beginning to workout. Honor your body and modify this workout as needed for you.